Routing in wireless mesh networks is of paramount importance to their good performance. As this type of network is becoming key to many application scenarios, it is fundamental to guarantee that routing is as efficient as possible. Despite extensive research work carried out in the past, existing routing algorithms have problems in terms of latency, throughput, network overhead, and/or scalability, depending on their type. 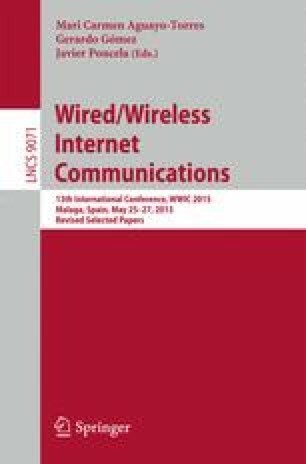 In the current paper we propose a hybrid wireless mesh networks routing algorithm that addresses the referred problems, exploring the ant colony optimisation paradigm. The algorithm, named AntWMNet, was extensively studied through simulation using OMNET++, and the results show that it clearly outperforms the reference AODV algorithm. The authors would like to thank Marco Dorigo, Frederick Ducatelle, Mudassar Farooq and Alfonso Ariza for their help, influence with their previous work and kindly replied messages. The work presented in this paper was partially financed by the University of Málaga and by the iCIS project (CENTRO-07-ST24-FEDER-002003, http://icis.uc.pt).